In 2013 the Cloud Security Alliance released a report, which identifies and describes 9 significant threats to Cloud computing . This report was conducted through a survey of experts and intends to help companies in their Risk assessment. The Cloud Security Alliance (CSA) is one of the first nonprofit organizations that have tried to set up standards for best practices for secure cloud computing. They further try to offer guidance and security education. 1. Data Breaches: Data breaches occur when sensitive information of a company falls into the hands of its competitors and cloud computing introduces new ways of attack [1,3]. 2. Data Loss: Data Loss can happen in several ways and is a terrifying thought for businesses. Accidental deletions by the CSP or physical catastrophes are examples of possible ways of loosing data in the cloud. Another example is if the consumer encrypts the data before uploading it to the cloud but then looses the encryption key [1, 3]. 3. Account or Service Traffic Hijacking: There are different ways an account can be hijacked such as social engineering. If an attacker is able to get access to an account he can access, for example, sensitive data, manipulate it, and also redirect transactions [3, 9]. 4. Insecure APIs: Services provided by CSPs can be accessed through APIs and therefore the security of the cloud depends also highly on the security of these APIs. Weak credentials, insufficient authorization checks and insufficient input-data validation are some problems that can arise with APIs [3, 9]. 5. Denial of Service (DoS): Cloud System Resources are being overused by an attacker, which prevent users from being able to access their data or applications [1, 3]. 6. Malicious insiders: This threat refers to the fraud, damage or theft of information and misuse of IT resources caused from inside the CSP [3, 9]. 7. Abuse of Nefarious Use: CSP are known to have weak registration processes and therefore can give easy access to attackers. Possible impacts include decoding and cracking of passwords and executing malicious commands [1, 3]. 8. Insufficient due diligence: Some companies do not have the right resources and understanding of the cloud environment to correctly evaluate the risk associated with responsibilities. Some implications can be contractual issues and operational and architectural issues . 9. Shared Technology Vulnerabilities: This threat can occur in all service models and refers to the fact that a single vulnerability could compromise the entire provides cloud . Vulnerability is the second factor companies have to consider when assessing the risk of migrating data to the cloud. Even though many types of vulnerabilities exist, when identifying them it is important to make sure they are cloud specific. What makes a Vulnerability cloud specific? According to the research conducted in  there are several criteria, which can be met by a vulnerability to make it cloud specific. Virtualization, service- oriented architecture and cryptography are examples of core technologies of cloud computing. A Vulnerability is cloud specific if it is frequent and fundamental to these core technologies. 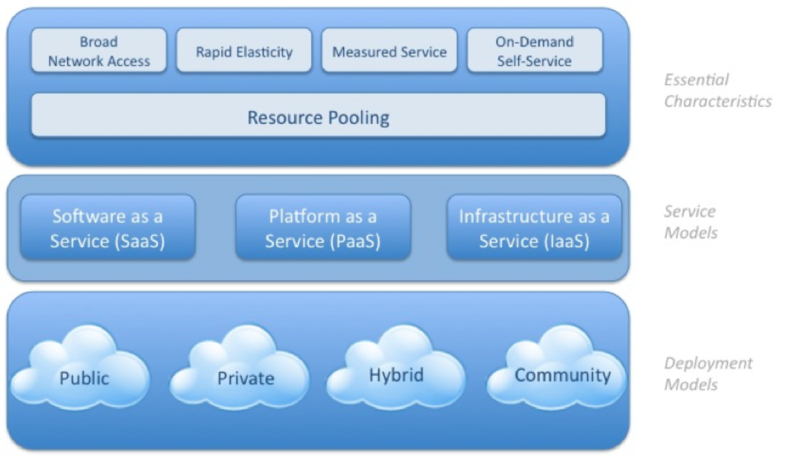 Elasticity, resource pooling and pay-as-you go mode are example on the other hand of cloud characteristics . A Vulnerability is cloud specific if its root cause is in one of those characteristics. Another criteria that makes a vulnerability cloud specific is if it hard to implement existing security controls to cloud innovations. 1 Session Riding and Hijacking: This vulnerability is related to web applications weaknesses. Session Hijacking is unauthorized access is gained through a valid session key . Session riding on the other hand is when the attacker sends commands to a web application by tricking the user open an email or to visit a malicious website . 2. Reliability and Availability of Service: This vulnerability takes into consideration that cloud computing is not perfect. More and more service are built on top of cloud computing infrastructures. In case of a failure a large amount of Internet based services and applications may stop working. The paper  give the example of an event in 2008 when Amazon’s Web Service cloud storage infrastructure went down for several hours. This caused data loss and access issues. 3. Insecure Cryptography: One of the fundamental problems in cryptography is the random generation of numbers. If numbers used in cryptographic algorithm are not truly random flaws can be found easily. The Virtual machines used on the cloud do not have enough sources of entropy and are therefore susceptible to attacks . 4. Data Protection and Portability: This vulnerability addresses the questions of what happens with the sensitive data in case of contract termination or in case the CSP goes out of business . 5. Virtual Machine Escape: This vulnerability refers to the possibility of breaking out of a virtual machine and interacting with the host operating system. Given that many virtual machine can exist in the same location increases the attack surface for the attacker . 6 Vendor Lock-in: The vulnerability lies in companies being dependent on the CSP they have initially chosen. Inconsistencies between CSPs and lack of standards make it hard for companies to switch providers . 7. Internet Dependency: Cloud Computing is very much dependent on the Internet. Users usually access services through web browsers. Some critical operation such as Healthcare systems needs to be up and running 24 hours. The question arises in situations where the Internet is not reliable . Having identified the risks of cloud computing it is then possible to assess which data or applications should be migrated and how much security is needed. Further, it is possible to come up with countermeasures or safeguards to mitigate these risks. Countermeasures may come in various forms such as policies, procedures, software configurations, and hardware devices . For the threats and vulnerabilities mentioned in this report there exist countermeasures that can help mitigate the risk. Papers such as , , and  give possible solutions to these risks. Some of them are for example Identity and access management guidance for the threat of account or service hijacking . The CSA has issued a report to provide a list of best practices such as separation of duties and identity management . For the threat of data leakage for example the main countermeasure is encryption [8, 6]. Even though there are many countermeasures that have been identified a good practice for companies is to have a good Service Level agreement (SLA) with the CSP. SLAs are the only legal agreement between client and service provider and should cover aspects such as security policies and their implantation and also should discuss legal issues in case of misuse of services . The CSA further has come up with a framework that can assist in looking at the aspects of Governance, Risk and Compliance (GRC) in a company’s IT policy when adopting a new solution. Their framework assists in assessing Clouds provided by CSPs against established best practices and standards. We have looked at Threats and Vulnerabilities and come to conclude that there are still several issues to cloud computing that need to be solved. Therefore, it is only understandable that companies still view cloud computing skeptical and do not adopt it as an option without consideration. Companies themselves should ensure through service level agreements that they get the security they need. Further we are able to see through organizations such as the Cloud Security Alliance that there are efforts in trying to create standards and help companies in choosing the right provider. Bamiah, Mervat Adib, and Sarfraz Nawaz Brohi. “Seven Deadly Threats and Vulnerabilities in Cloud Computing.” International Journal of Advanced Engineering Sciences and Technologies (IJAEST) (2011). Brunette, Glenn, and Rich Mogull. “Security guidance for critical areas of focus in cloud computing v2. 1.” Cloud Security Alliance (2009): 1-76. Dahbur, Kamal, Bassil Mohammad, and Ahmad Bisher Tarakji. “A survey of risks, threats and vulnerabilities in cloud computing.” In Proceedings of the 2011 International Conference on Intelligent Semantic Web-Services and Applications, p. 12. ACM, 2011. Grobauer, Bernd, Tobias Walloschek, and Elmar Stocker. 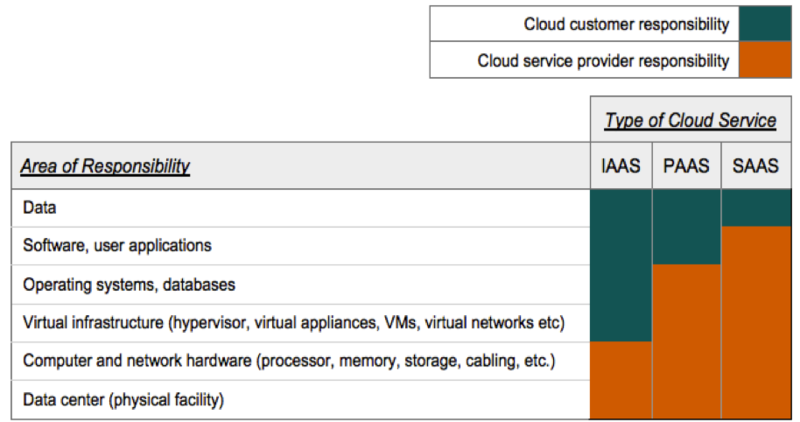 “Understanding cloud computing vulnerabilities.” Security & Privacy, IEEE 9, no. 2 (2011): 50-57. Hashizume, Keiko, David G. Rosado, Eduardo Fernández-Medina, and Eduardo B. Fernandez. “An analysis of security issues for cloud computing.” Journal of Internet Services and Applications 4, no. 1 (2013): 5. Kandukuri, Balachandra Reddy, V. Ramakrishna Paturi, and Atanu Rakshit. “Cloud security issues.” In Services Computing, 2009. SCC’09. IEEE International Conference on, pp. 517-520. IEEE, 2009. Munir, Kashif, and Sellapan Palaniappan. “Secure Cloud Architecture.” Advanced Computing: An International Journal (ACIJ), 4 (1), 9-22. (2013). Yu, Ting-ting, and Ying-Guo Zhu. “Research on Cloud Computing and Security.” In Distributed Computing and Applications to Business, Engineering & Science (DCABES), 2012 11th International Symposium on, pp. 314-316. IEEE, 2012. A major UK-based telecommunications company proposed to conduct a joint research with MSc Information Security students at UCL. The use of cloud computing as a way of providing and consuming on-demand, pay-as-you-consume ICT service has revolutionised the industry. Services like Amazon EC2 have seen a huge increase in its revenue. However, currently it is the Small and Medium Enterprises (SMEs) that are leading the way in the use of these public Infrastructure as a Service (IaaS) offerings. The company envisages that as these services become more mature and secure, they will be adopted and used by more “traditional” enterprises like the finance, health and government sector. Governance, Risk and Compliance (GRC) plays a very important role in the IT policies of these institutions and as such, for any solution to be adopted by them, these aspects of the IT policies will have to be considered. Several initiatives have been started to address this issue. The Cloud Security Alliance’s GRC Stack is one of the most mature and accepted initiative in this area. It consists of four main stacks – Cloud Controls Matrix, Consensus Assessments Initiative, Cloud Audit and Cloud Trust Protocol. It was very interesting to participate in the series of workshops to investigate how this framework would impact and be used by the company. This helped me to learn a lot about the telecoms industry and the way they are adopting cloud technologies in a secure way. The inability to clearly identify where the sensitive data is stored and how it is processed is a major concern of many companies. The problem becomes more serious when the enterprise processes cards payments and has to comply with regulatory requirements, such as PCI DSS. A need for compliance of the infrastructure with regulatory requirements plays an important role when having to decide whether to move applications or infrastructure to the cloud. This chapter will identify specific requirements for PCI DSS compliance in a cloud computing environment and will look at research done in the field of continuous auditing. For each risk they provide a set of recommendations, specifically covering compliance aspects of the cloud computing environment. Some research has been done in the field of developing models to automate the process of continuous auditing in order to ensure adherence to regulatory requirements. Building on Speeter’s research , Chieu, Viswanathan, and Gupta in their work , push the concept further and not only provide solutions on gathering information on network and server configuration, but also provide a tool to automate this process and use collected evidence for assurance purposes. 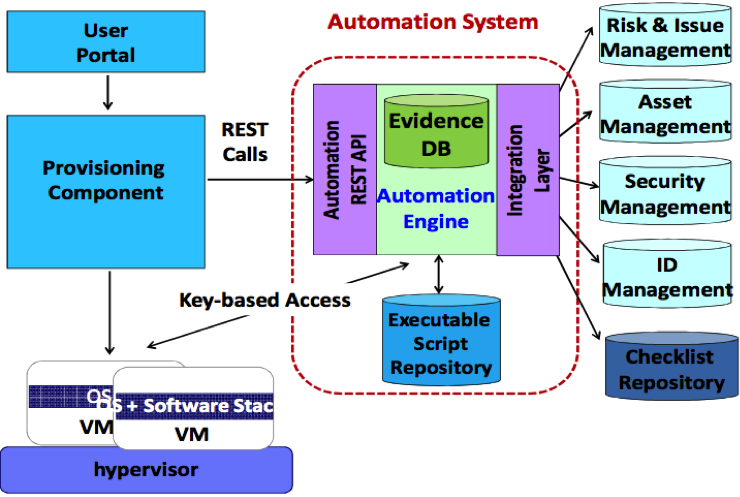 The researchers acknowledge all possible benefits of cloud computing, but mention that “the steps of validating the configuration and security of the target workload for compliance and assuring its quality may be complex and very time consuming.” Emphasizing the difficulties of the validation process when performed manually, the authors present the design of an automation system (Figure 2) to carry out the validation of configuration on target cloud services for compliance . The authors describe in detail how to use the presented system to collect and verify all collected evidences and ensure adherence with the regulatory requirements in the cloud computing environment. This development makes a large practical contribution, and supports various operating systems and middleware stacks. It also was deployed in shared private enterprise cloud (IBM SmartCloud Enterprise Plus . However, authors acknowledge that the developed system “lacks the flexibility to support the diverse private cloud environments in which different back-end tools may have to be integrated.”  Allowing such flexibility may result in wider adoption and use for practical purposes, such as automation of PCI DSS compliance checks. Acknowledging the contribution of Breaux and Antón’s research  Accorsi and Sato claim that there is still no sufficient research results to support creation of a uniform way of expressing the compliance requirements . Moreover, in their paper, the researchers emphasize the absence of tools for automating certification procedures, and that the “multitude of regulations and contractual rules increases the complexity of checking compliance” . The authors analyze some regulatory requirements and develop nine common categories. They then focus on workflows and create Petri net , , ,  representation of these categories. They use the developed model to check the compliance of a given business process in relation to a given requirements. In case of non-compliance, the developed model gathers necessary evidence and points out to the problem. Unlike Sadiq, Governatori, Namiri , who focus only on a single legislation, Accorsi and Sato present their categorization using several different legislations, which may be beneficial for cloud service providers who need to comply simultaneously with many different regulations. However, in their research, the authors analyze mainly business process design issues and only several legislations, ignoring, for example, PCI DSS and, more importantly, many requirements which may be specific for this legislation. Hizver and Chiueh in their paper  tackle another side of automated compliance monitoring – discovering credit card flow, which is a pre-requisite to the implementation of PCI DSS. Their research has valuable practical application, because in order to comply with PCI DSS requirements, merchants must understand how credit card data flows in their information technology infrastructure and must document it. This may result in problems with out-of-date and difficult to maintain documentation of this flow when infrastructure changes. To avoid manual effort, the authors develop a tool that can discover payment card data flow from distributed systems in an automated manner. The foundation of the tool is virtual machine introspection technology . Researchers present and thoroughly analyze the developed tool and show evidence that it can fulfill its purpose, despite the fact that communications between distributed systems are encrypted. Existing issues with compliance monitoring prevent companies from outsourcing their application and infrastructure to a third party cloud computing environment  and slow down the process of realization of the cloud computing potential . Although some positive results are achieved in the field of identifying problems with cloud computing and compliance, more research should be done in the field of automation of continuous monitoring for PCI DSS requirements in a cloud computing environment. Models should be developed and tested to allow companies to ensure their adherence with requirements not only of application, but also of external environment, especially if outsourced to third parties. Garfinkel, Rosenblum (2003) “A virtual machine introspection based architecture for intrusion detection,” Proc. Network and Distributed Systems Security Symposium,, p. 191-206. The basis of cloud computing is a notion of time sharing,  developed in the 1950s and allowed shared use of mainframes CPU time through terminal connection. Later, the availability of cheap computers and high-bandwidth networks, coupled with development hardware virtualization technologies, resulted in the rapid growth of cloud computing , , . Companies before making a decision on each type of cloud should weigh all benefits and limitations of each type in terms of cost and security, among others. However, the authors only briefly discuss each of these areas and focus mainly on the results of survey , not paying attention to such sensitive aspects of cloud computing as legal, privacy, compliance, governance, etc. Zhang, Qi, Lu Cheng, and Boutaba  also present only a brief overview of cloud computing technology and discuss core research challenges. The paper does not develop new models or concepts, but instead only analyses current developments and trends. Although the researchers touch on security issues in general, they focus mainly on basic issues with confidentiality, integrity and availability, failing to address and explore important problems such as compliance in depth. Zhang, Cheng, Boutaba. (2010) “Cloud computing: state-of-the-art and research challenges.” Journal of Internet Services and Applications 1, p. 7-18.